When we think of symbiosis on tropical coral reefs, the classic example of clownfishes and their host anemones often comes to mind. However, there’s another model of symbiosis that’s every bit as fascinating to observe but much easier to recreate in an aquarium environment. I’m talking about the mutually beneficial relationship between cleaner shrimps and their fishy clients. While numerous shrimp species belonging to different families can justifiably be called cleaners, we’ll limit our discussion here to three very popular and relatively easy-to-keep species of the genus Lysmata—specifically L. amboinensis, L. debelius, and L. wurdemanni. All these species are strikingly beautiful animals, sporting bold color patterns that “advertise” their cleaning services. Fish customers will happily line up at coral-reef “cleaning stations” and present themselves to these shrimps to be picked clean of external parasites and dead tissue. Even large predatory fish will avail themselves of the cleaner shrimps’ services without making a meal out of them (usually). What’s more, unlike the fishes known as cleaner wrasses (Labroides spp., among others), which are obligate cleaners (meaning they don’t get nutrition from any other source) and commonly starve to death in captivity, the cleaner shrimps are very easy to feed in aquariums and will readily accept just about any prepared foods offered to fish. They’re also great candidates for smaller systems, even nano tanks, provided stable conditions and excellent water quality are maintained. This last point is important to remember, as Lysmata spp. shrimps are not tolerant of fluctuating or declining water conditions or the buildup of nitrate. Also, being very sensitive to sudden changes in water parameters, they must be acclimated very carefully and methodically to new systems. In addition to water-quality considerations, the rockwork in tanks housing cleaner shrimps should be arranged to provide lots of caves, overhangs, and ledges so the shrimps have plenty of places to take refuge. L. amboinensis, hailing from the Indo-Pacific and commonly called simply the cleaner shrimp or the skunk cleaner shrimp, is yellow overall with a bright-red band along the length of its back. Running down the center of the red band is a conspicuous, thinner white stripe. This shrimp’s front legs and long, waving antennae are also brilliant white. Incidentally, there’s an almost identical-looking Western Atlantic species (Lysmata grabhami) out there, but you’re much more likely to encounter L. amboinensis when shopping at your local fish store and the care requirements are pretty much the same for both. Based on personal experience as well as the reports of many other hobbyists, L. amboinensis is the best of the three listed here when it comes to cleaning its tankmates. In fact, I’ve kept several over the years and all proved to be reliable cleaners. This species will also climb onto your hand and give it a good going over—especially if you happen to be pinching a little fish food when you put your hand in the tank. Another Indo-Pacific cleaner, L. debelius has been my favorite of the cleaner shrimps since I was a kid and first laid eyes on a specimen at the Shedd Aquarium in Chicago. This species, commonly called the blood shrimp, fire shrimp, or scarlet cleaner shrimp, is bright red overall with white “stockings” on its legs, white antennae, and a smattering of white dots on the anterior portion of its body. This more shy and reclusive species will also clean piscine tankmates and hobbyists’ hands, but not as reliably or as aggressively as L. amboinensis will. Creating several ledges and overhangs in the rockwork toward the front of the tank will increase your opportunities to view this retiring shrimp. L. wurdemanni is the least reliable when it comes to actually exhibiting cleaning behavior in aquariums, but it’s a worthy choice for aquariums nonetheless. 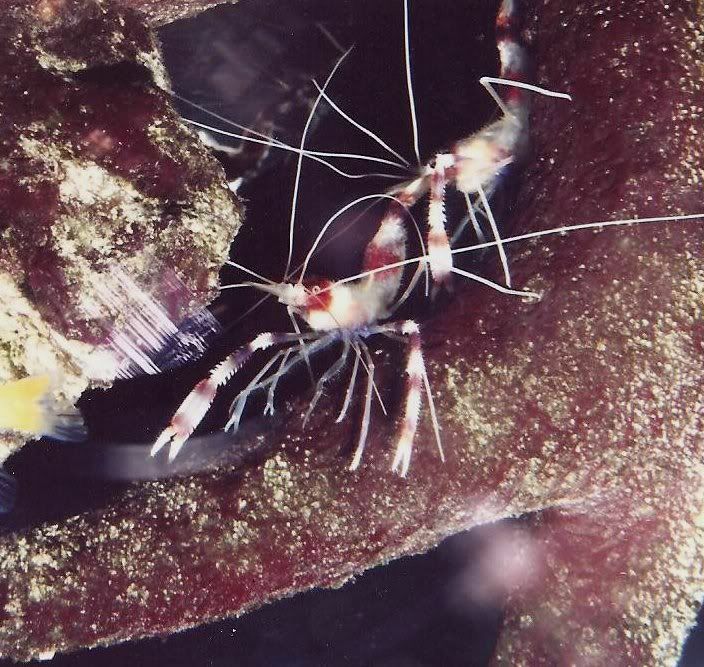 This denizen of the Western Atlantic is among several that are commonly called peppermint shrimp, owing to their intricate red-and-white striping. I’ve included it here not just for its good looks and relative ease of care, but also because it can sometimes be pressed into service to eradicate pesky, invasive Aiptasia anemones. However, if you introduce this species for Aiptasia eradication, be aware that not all specimens are created equal in this regard. Some will go right to town on them while others might pay them no mind. Also, not all species given the common name “peppermint shrimp” are Aiptasia eaters—and one, Lysmata californica, is a cool-water species that is not even suitable for tropical aquariums. Make sure the shrimp you’re getting is L. wurdemanni if your objective is Aiptasia control. The cleaner shrimps can be kept with any fish that aren’t prone to crunching or gulping down small crustaceans. That means triggerfishes, puffers, groupers, larger hawkfishes, larger wrasses, morays, lionfishes, and the like are not ideal tankmates. Despite the fact that these fishes will take advantage of cleaner shrimps’ services in the wild, there’s always a chance their predatory instincts will kick in when the two are permanently confined together in a closed system. With respect to their inclusion in reef systems, L. amboinensis and L. debelius can generally be trusted to leave corals and other sessile invertebrates alone. L. wurdemanni may be less trustworthy in reef tanks. After all, it’s not too much of a stretch for an Aiptasia-munching shrimp to develop a taste for other invertebrates. (Circa 1974) spawned in my 40 gallon tank for about 7 years. I had the female and later added a juvenile male. As soon as he hit the water she was on him and it was love at first sight. But he was to young to mate so she had to date him first for a few months. But they remained inseparable until the end. I have all 3 in my 120 liter tank and they are fantastic. Somtimes there are a few “school yard scuffles” for territory but otherwise they get on well together each with their own character. Love mine. Sounds like a neat lineup, Clint! Thanks for sharing! I love my Scarlet Skunk Cleaner Shrimp. He’s the center of attention in my 44 gal corner tank. Wish I knew how to post a pic. He’s beautiful. I’m afraid he will jump off I fill my water to the rim. Anybody ever experienced that?